Survivor Series – something we always seem to forget about until it’s upon us. WWE is stepping up their game with Survivor Series by calling in some big names to be in-ring with the brand split. There is buzz around this year’s Survivor Series – some good; some bad; but, legit buzz. We’re breaking down some AJ Styles v Brock Lesnar. What talent does WWE have in the pipeline to sustain them 5 years from now? This may be the oldest Survivor Series talent line-up. The Shield vs The New Day – We’re looking at a potentially good tag match. We’re calling a Kurt Angle singles match by Wrestlemania. The Charlotte v Alexa Bliss match has the potential to steal the show. War Games is coming. We’re sharing some thoughts. The many faces of Alicia Fox. The Ric Flair 30-for-30. We watched it. We’re talking about it. Follow our stable on Twitter: BC Steele (@1SFpodcast), Larry (@MutilatorLarry), Sorg (@Sorgatron), and Bobby F J-Town (@Bobbyfjtown). GLOW is coming to Netflix. What was the original show it was based off of like? We introduce Larry to Wrestlicious! Big Question: Who would you add to current tag teams to create The New Day or Freebirds style trios? How much do big sporting events like the NBA Finals affect WWE RAW writing? We’ve got RWA ring announcer, Burt LeGrande, on for Wrestling Mayhem Show 556. He is joined by Rob, Larry, Matt, Sorg, and Mad Mike, as we talk what’s happening in the world of wrestling this week! We’re sharing some thoughts on the Royal Rumble – including a Mayhem Voicemail from Mad Mike! We’re making bets with foreign currency. Because we can. Mad Mike and Burt LeGrande are sharing conspiracy theories about Royal Rumble numbering. Larry’s beef with the Royal Rumble was Ellsworth not eliminating Braun Strowman! Sorg couldn’t tell between Royal Rumble pre-show and actual show because pre-show matches were that good. Matt is calling for WWE to use marathon bibs for Royal Rumble entrants in the future. We’re sharing our thoughts on Bayley vs Charlotte at Royal Rumble. The many characters of John Cena is a thing we’re discussing on tonight’s show! We’re sharing our thoughts on NXT Takeover San Antonio. It was a strong sign game atthe Royal Rumble. Thanks to Brandon for sharing the Universal Champion belt redesign news. 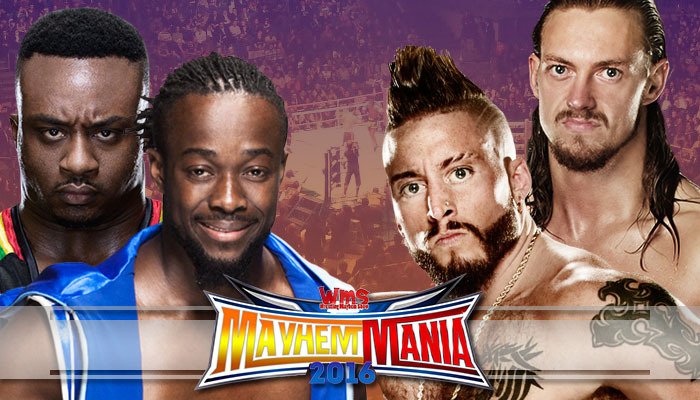 New Day needs to win Money In The Bank – we need to see it with a great faction! Shout out to Friend Of The Show Delilah Doom on her appearance on Smackdown LIVE. This week’s Big Question: What one wrestler you would have and what weird MTV-style gimmick they would they have for a show? From Matt – He would go with RJ City as a pregnant 16-year-old. It’s Mayhem Mania time with Matt! Follow our stable on Twitter: Burt LeGrande (@RealOSBL), Rob Brown (@RobBrownPA78), Mutilator Larry (@MutilatorLarry), Matt Carlins (@MainstreamMat), Mike Sorg (@sorgatron), and Mike Rohrssen (@MadMike4883). Welcome to the second year of Mayhem Mania! What is Mayhem Mania? It’s not quite a game. It’s not really a contest. It’s more like a competitive thought experiment. 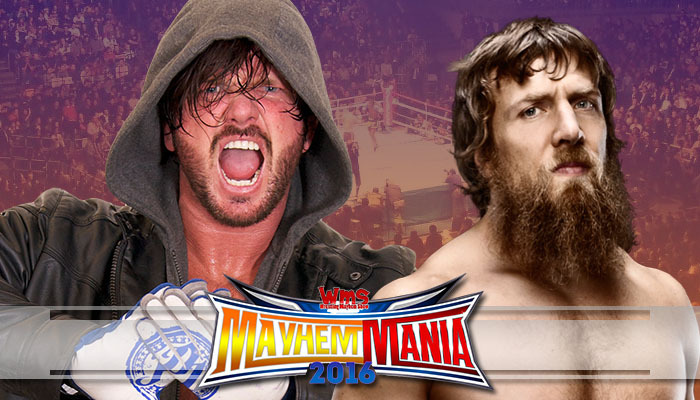 The object is to create the best WrestleMania card possible – NOT necessarily to predict what WWE will do. Over the course of the coming weeks, matches will be created, matches will be changed and a select few will survive unscathed long enough to GRADUATE to the relative safety and security of the SUPER CARD. The goal is to graduate 8 matches before the real WrestleMania. This is not fantasy booking (even though it kind of is). Any match created must be possible in real life. That means all wrestlers come in their current physical and emotional conditions. Anyone selected for a match must have a reasonable chance of being hired by WWE to appear on the real-life WrestleMania card. Simply put, we have to play by the same rules as Vince McMahon. Guys are injured? Too bad. Guys are under contract with another company? Too bad. That said, you’ll see over the coming weeks that the current professional wrestling reality is flexible. Part of the fun of Mayhem Mania is pushing those limits. There will be twists. There will be surprises. There will be unfair rules for certain rounds (who will ever forget the Jar Of Midcarders?). There will be hurt feelings. It’s a TON of fun. If you want to see how every round played out last year, click here. And now, on with the show! 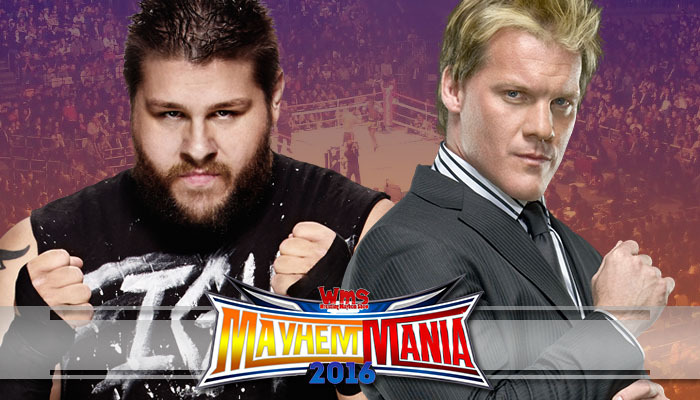 Round 1 of Mayhem Mania 2016 was held during the Wrestling Mayhem Show (@MayhemShow) on January 12. Four members of the WMS Universe were each asked to create a single match. Here’s what they came up with. Now what? Next week, we’ll have four more matches created by members of the WMS Universe. No more than 8 matches are allowed on the card at any one time, unless a match GRADUATES to the SUPER CARD. That will open a slot for a new match to be created. Hope you’ll follow along over the coming weeks, and thanks in advance for supporting Mayhem Mania! *huge thanks to Tonio Garza of thewrestlingrevolution.com for the images!